Mostly, 20-year-old performance sedans with high miles are something of which to be afraid – they’re near or beyond the end of their designed lifespans, all the luxury bits are failing and expensive to replace, and the engines are ready for a rebuild. As with all rules, though, there are some exceptions, both for cars known for their longevity, as well as for cars that have been fanatically maintained by enthusiasts with little regard to cost. Sometimes, checking the compression and making sure the critical systems are in working order will tell you more than the odometer ever could. 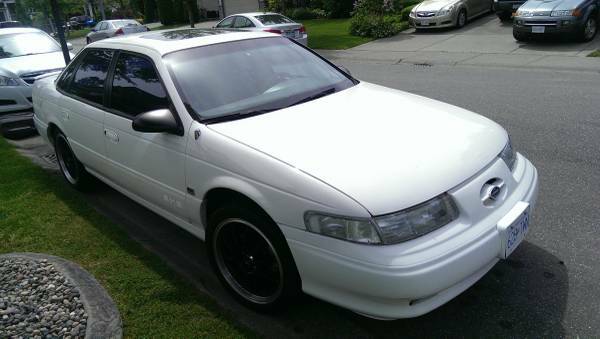 Check out this 1994 Ford Taurus SHO, for sale for C$2800 ($2560 today) in Langley, BC. White is not a great color, since it makes it look like it pulled off a Hertz lot in 1994, but that’s also the strength of that color. Subtlety is your friend when you have that fantastic Yamaha V6 under the hood. The car looks very decent, although you should be prepared for a fair share of stone chips up front, and since it’s a 1990s car, failed clear coat on the roof. However, it does give the impression of a car that’s been cared for. 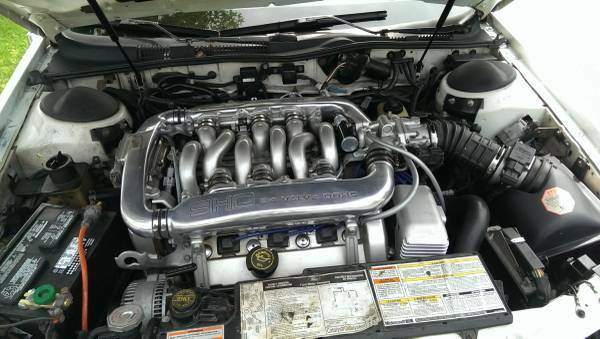 And here’s what brings this car to the level of, say, an Alfa 164 – the engine. Designed by Yamaha, it has a gorgeous tangle of intake pipes and not a single plastic panel to disguise its mechanical beauty – it’s arguably one of the most beautiful engines in a modern car. It’s said to have 293,000Km (about 182,000 miles), but benefits from recent seal and belt replacements by the previous owner, a Ford technician. 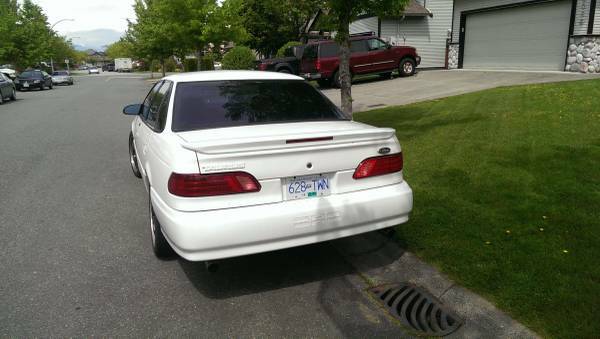 The current owner has only had the car for a few months, but used it to commute to Vancouver, so should have a good idea of the car’s reliability and condition. If not, a call to the previous owner might help answer some questions too. While the leather panels on the seat bolsters show some splitting, it all looks very clean, again indicative of the level of care. 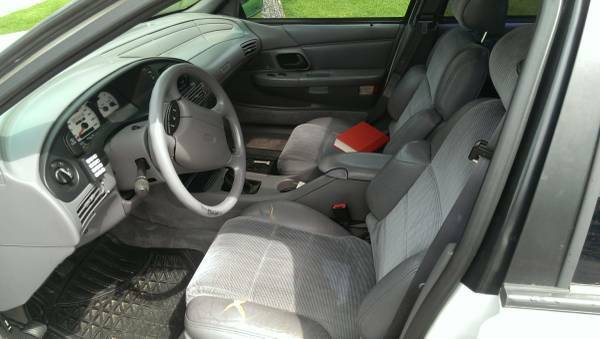 The blah interior is kind of depressing, but you probably won’t care about that when you’re enjoying the novelty of driving a Taurus with a clutch, never mind the soundtrack coming from the engine. Apparently the car also has Euro/LED lights all around, but it’s not clear what that means since there was no European Taurus. Everything looks good here too, and the car seems to have larger-diameter exhaust pipes. The seller is willing to send pictures of any area of interest, so a few emails should help clarify the condition of the car. Worst case, if you buy it and the engine fails, you have the best coffee table base a gearhead could hope for. This entry was posted on June 6, 2014 at 10:14 am and is filed under Feature. You can follow any responses to this entry through the RSS 2.0 feed. You can leave a response, or trackback from your own site. I had one of these on my lot about 12 years ago in much nicer shape. I think I got $1500 for it; that stickshift made them a hard sell to your average jamoke. These are a much better car then the later V8 versions; those had lots of constant hard to fix and expensive problems. I’m quite unsure about this, but I may know the previous owner of this car. I remember it as problematic, but this could very easily be different car.